This months spotlight is on Military portraits. 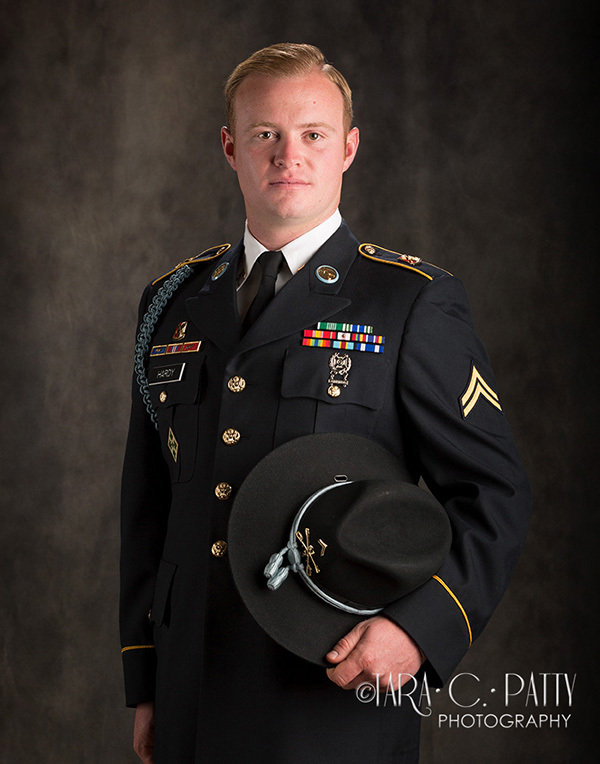 We don’t photograph many members of our military in uniform but from time to time we get a request for a formal portrait in their dress uniform. Usually it’s a service member getting ready to transition out of the armed forces and they want a portrait to remember their service; or they want a nice portrait for family. This young man had a little different spin on this concept. He wanted a traditional portrait in his dress uniform for family for Christmas. But he also wanted to get an old portrait he had of his grandfather framed as a gift for him. He had a digital image of the portrait but could not locate any studio where it was taken (in another state). His family sent him the digital image with the hopes that we could reproduce it and get it framed. Then his plan was to send his grandfather a nice large framed print of that plus one of himself in uniform. He told me how proud his grandfather was of him serving in the Army and wanted to surprise him with this special gift. What a wonderful gift for family—a cherished portrait to be enjoyed for years to come. That’s why I enjoy so much helping people create memories through fine art portraits that not only they will cherish but also the next generation. Did you know we give a 10% discount to any active duty military on any products? So if you are a service member keep that in mind should you wish to create a portrait for your family. This is not just for service members in uniform in a portrait but for any individual or family portrait—it even extends to our pet portrait brand should they wish to bring in their dog. So think how you might create a memory that can be passed to the next generation.